St Pancras and Kings Cross are chalk and cheese. The former was deliberately designed to compete with its neighbour on the Euston Road, an ostentatious Gothic showpiece to lure passengers onto the Midland Railway. At the front of the station they planned a massive 400-room hotel, later downsized to 300 (by lopping off the upper two storeys) because funding ran out during construction. The height of Victorian luxury, alas it opened just before the era of en-suite plumbing, so was built with no running water to the rooms and only eight shared bathrooms. Impossible to upgrade thanks to two-foot concrete floors, the white elephant closed in 1935 and was then transformed into railway offices. When these subsequently closed the building fell into disrepair, rescued only when Eurostar turned up and major investment followed. Part became a five star hotel, the remainder apartments... you probably know the story. When the Midland Hotel appeared on the list for Open House in 2002, I came twice. There weren't the queues in those days, before social media, so those of us in the know turned up and enjoyed the special spaces in relative comfort. 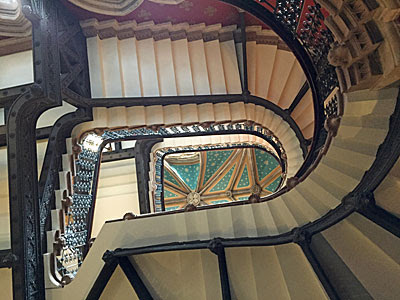 Anyone could walk in off the street and climb up the amazing twin staircase, immortalised by the Spice Girls five years earlier, all the way to the blue-spangled landing. The upper corridors had seen better days, replete with peeling paint and dusty floors, but visiting the historic shell left a lasting impression. How things change. In 2015 the hotel no longer partakes in Open House, apart from reluctantly allowing tour groups to peer briefly within. Organised tours are allowed as far as the lobby at the foot of the grand staircase but no further, the ascent signed Hotel Guests Only, so I could only peer up at the glories above and remember how great they must now be. Successful private buildings only partake in Open House when under construction, it seems, or freshly completed and in need of publicity. Halfway along the curving façade of the main building is a small ramped entrance, generally overlooked, providing an entrance to the St Pancras Apartments. The hotel gets the first floor, where it maintains suites starting at £400 a night (and rising past treble that), while everything above is now flats. Residents are provided with lifts, narrow two-person jobs (because carving space for anything bigger proved impossible), while Open Housers must take the stairs. There are 78 stairs to the second floor, these nothing terribly special, but at one point affording a view down across the Booking Office bar. The second floor corridor is rather more swish, as befits former staterooms, with squared-off lanterns above and a handful of understated front doors on each side. Occasionally the carpet narrows to make room for tall wooden cabinets containing electric cables and utilities, these threaded through the former laundry and rubbish chutes. People will put up with a lot in order to live in heritage deluxe. Service staircases were installed to help an army of chambermaids and butlers keep the original guests well-tended. These now link the various floors of apartments, these either duplex or triplex, hence it's a long hike between floors. On the cantilevered staircase allocated to Open Housers, a particular treat is the chance to look down on the Eurostar terminal below. St Pancras's huge clock gets in the way, seeing the back of which is a bit of a treat in itself, and there might be up to six sleek trains as well. I'd never twigged the hotel lay immediately behind the clock, let alone steps I'd one day be allowed to tread. The fifth floor corridor is somewhat blander than the second, though I suspect the handful of apartments to either side are no less expensive. And at the far end is flat number 5.01, St Pancras's attic flat, and this weekend's extra special destination. 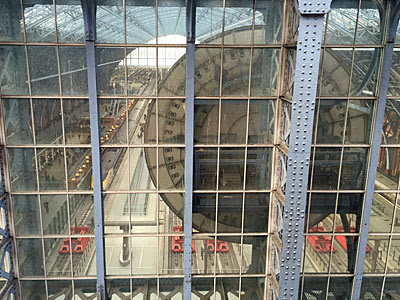 Imagine being the lucky soul who gets to live inside St Pancras Clock Tower. A flight of steps behind the front door leads up to a 10-foot-high room within the pointy turret, the ultimate garret playroom for a lover of architecture with money to spare. Art and photographs of other clocktowers adorn the walls, while a piano sits unobtrusively in one corner... though just imagine how they lugged it up here. Further steps lead up to a large bookcase above head height, from which a projection screen can also be unfurled. Meanwhile a separate chain of four laddered staircases climbs steeply into an unseen void where the clock's machinery can be tweaked. The Midland used to keep it running two minutes fast to encourage passengers to hurry, whereas these days it's far better synchronised. 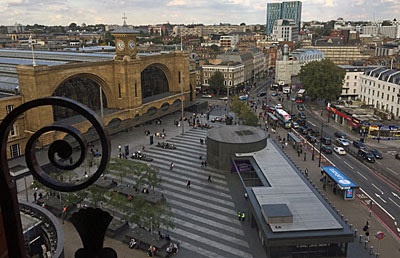 And the view out of the windows is pretty damned good, if a little constrained to the south, with the best panorama being of Kings Cross station nextdoor and the public square out front.